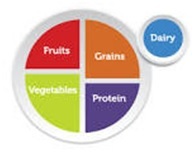 In recent years, the American Diabetes Association has produced a visual aid that they call My Plate, that shows how a human-being’s dinner plate should look. Let’s follow their lead and create a visual aid that will help us properly balance our primate’s diet at a glance. 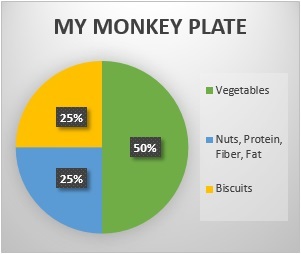 Using the American Diabetes Association’s visual tool My Plate as a model, let’s look at what our Monkey Plate should look like. Let’s see what My Monkey Plate looks like with real food. 50% Vegetables: Carrots , broccoli, red bell pepper, cucumber, snap peas, zucchini, purple cabbage, cherry tomato, golden beet. 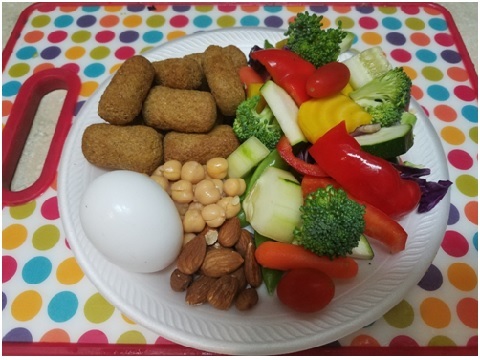 25% Nuts, Protein, Fiber, Fat: Hard-boiled egg (in shell for enrichment), raw almonds, garbanzo beans. 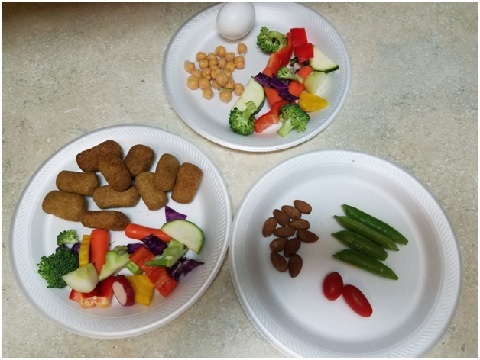 In keeping with the My Monkey Plate visual plan for your monkey’s diet, you can provide lots of variation in their selections and make every day different and interesting, while keeping their diet properly balanced. Let’s look at a couple other examples. 50% Vegetables: Spinach, cauliflower, green beans, eggplant, sweet potato, blueberries, celery, snow peas. 25% Nuts, Protein, Fiber, Fat: 1 oz. chicken breast, peanuts (in shell for enrichment), ½ slice dark whole grain bread spread with coconut oil. 50% Vegetables:Bok choy, asparagus, red beet, yellow squash, bell pepper, broccolini, tomato, jicama, romaine lettuce, alfalfa sprouts. 25% Nuts, Protein, Fiber, Fat: Grilled salmon, avocado slice, whole grain cereal and sunflower seeds (in forager for enrichment). The daily diet, or Monkey Plate, should be divided into at least two feedings and can be divided into as many small meals and snacks as you choose. Knowing your monkey’s eating habits will help you determine how many small feedings he needs. If your monkey is one that is very food motivated and tends to eat everything that is offered, you will need to spread his diet out over several small feedings throughout the day. If your monkey will nibble at his food throughout the day while playing and exercising, you can probably feed twice a day and allow him to regulate his own intake. Many monkeys like to “taste and waste,”and will often waste up to 25% of their diet. If your monkey is a messy eater, allow up to 25% more in each food category for waste. Snacks should come from the Monkey Plate, not extra foods in addition to the planned daily diet. If you include a small piece of fruit in your monkey’s diet, give it as a snack along with nuts. Your monkey’s favorite veggies along with nuts also make a great snack, as does anything that is presented with the shell on or in a foraging device, as this stimulates problem-solving and higher order thinking skills and keeps your monkey friend busy. My Monkey Plate divided into two feedings. My Monkey Plate divided into two meals and a snack. The Monkey Plate should contain all the food that will be fed that day, divided up into as many meals and snacks as you wish. Actually portioning out the whole day’s food in the morning will help you stay on track and assure that the proper portions are offered. Allow roughly one full-size (approx. 1”x2”) biscuit per pound of body weight, or a comparable number of mini biscuits or stick biscuits (such as Mazuri New World or Zupreem Dry Diet). Feed the least favorite foods at the time of day when the monkey is the hungriest. Never feed “white” foods such as bakery goods made with white flour and sugar, white potatoes, white rice or white pasta. If your monkey takes a bottle containing biscuits or other foods, include these items as part of the daily diet. Reserve fruit and other favorites for treats and snacks, and include them as part of the daily diet. Always feed a protein food, such as nuts, along with fruit or other high-sugar foods. Allow for up to 25% waste. Routinely monitoring your monkey’s weight provides an easy way to determine if her diet is adequately meeting her needs. An increase in the weight of a mature monkey that is no longer growing may indicate that her rations should be decreased. Be aware that some species may continue to grow until10 years of age, particularly males. Be alert for other signs of obesity such as breast enlargement and/or a “pot” belly. A decrease in weight in a monkey that is not overweight may be a signal that her rations should be increased. Weight loss can also be a sign of illness, particularly diabetes. Unexplained weight loss that cannot be attributed to changes in the diet should be evaluated by a veterinarian. When increasing or decreasing the food volume, remember that the changes need to take place in all three sections of the Monkey Plate. Increasing the number of biscuits calls for an increase in vegetables and other foods to keep the diet balanced and in the proper proportions, as does a decrease in these as well. Exercise is just as important as diet! Every monkey should be able to perform several hours of active exercise daily such as running, jumping, and climbing. If the monkey’s enclosure is not large enough to allow for active body movement, another space within the habitat should be provided for essential exercise, such as an outdoor enclosure, a playroom or free time off-leash within the home. A monkey that gets adequate active exercise daily can have a much more lenient and liberal diet than one that is sedentary or housed in a small enclosure all day. Not only does exercise aid in metabolism, it also promotes strong muscles, healthy bones, stress-reduction and good mental health for our primate companions. 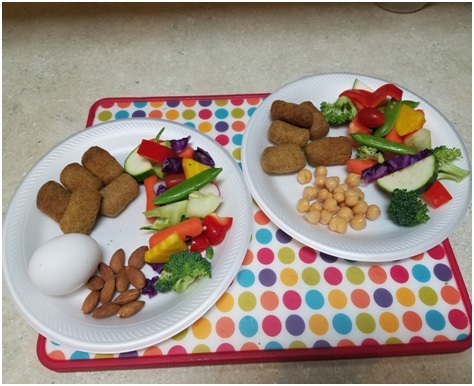 Try the Monkey Plate visual aid for yourself and see just how easy it is to feed your monkey a healthy, well-balanced diet! Next Entry: What about Leads and Neck Collars? Next Entry What about Leads and Neck Collars?